A refreshing smoothie that is super simple to make. The perfect way to cool down after a hot curry. Stand one of the mangoes upright with the narrow end facing you. Slice off the 'cheeks' on either side of the stone and slice these in half lengthwise. Cut around the stone to take off as much flesh as possible, capturing all the running juices in a bowl. Remove the skin by peeling or cutting the fruit carefully off it. 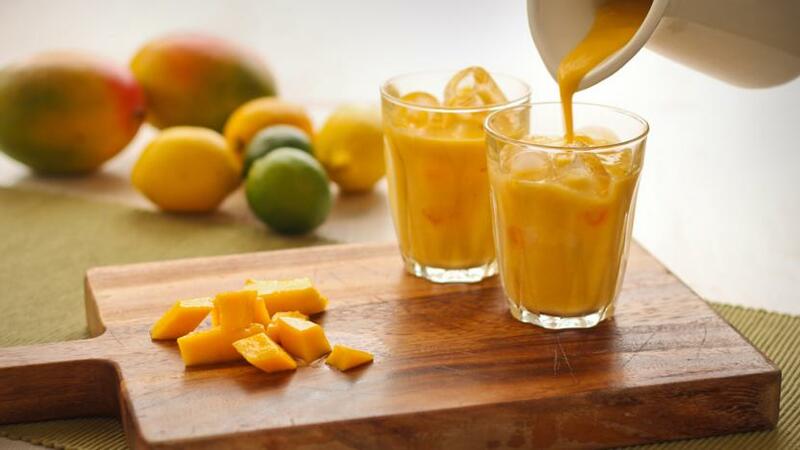 Repeat with the other mango. Discard the skin and purée the flesh and juice in a food processor or blender. Add the milk and honey and combine until it becomes a thick smooth mass. Chill until ready to drink. Add the ice cubes and serve straight from the fridge. A little goes a long way, so serve in small glasses.